Southern Senegal. We are on the border with Guinea, in a gallery forest, tracking chimps. We hear a branch break in the distance and move in that direction. I am in a full sweat. It is hot, humid in the forest of Dindefelo Reserve. It is rainy season, so we are soaked. My shoes are like sponges after crossing through a river. 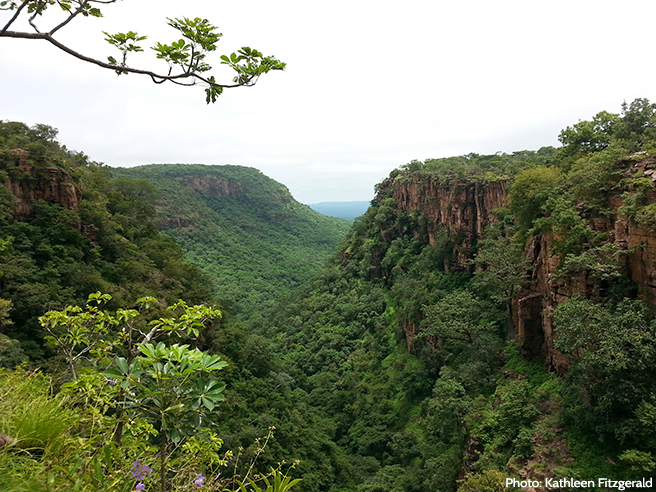 The rain has made the forest emerald green, lovely, however it makes tracking chimps difficult. Our guide from the local community walks quietly, with focus, listening, watching. I am following him closely because I do not want to miss the chance of seeing the chimps. We are walking up a loose scree slope, covered with vines, bamboo and debris. Trying to not make a sound while traversing this slope is a dance of sorts, a balancing act. With the crunching of leaves under our feet and the sound of the scree tumbling down the slope I cringe thinking the noise will scare the chimps and they will move further away. Above our heads we see their nests, small clumps of branches and leaves in the tree canopy. They make a new nest every night. We see their droppings under the tree, orange in color reflecting the fruit they eat. Filled with termites. We pass a termite mound and find the sticks they use the fish for termites. The sound of breaking branches is close, I crouch low to see through the forest. I see the branches move and then a flash of black drops from the tree—an arm, back, leg—it’s gone. We follow but not fast enough. After four hours up and down the slopes, listening, stopping, moving cautiously, the sun is starting to set and we surrender to the fact that we will not see the chimps today. A pit in my stomach of disappointment, but given their status, I am happy to know they are here, in this healthy forest. Chimpanzee, Pan troglodytes, is endangered—like all of Africa’s other great apes. Habitat loss and bush meat poaching is causing their decline. 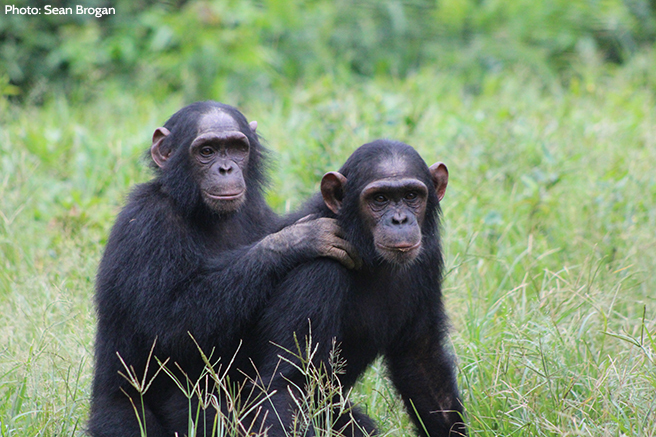 Here in this forest, AWF is working in partnership with the Jane Goodall Institute, the local protected area authorities and the communities to ensure that these chimps continue to thrive in a safe haven. Use our interactive storymap to discover what challenges threaten the survival of Africa's great apes, and see how AWF is working to ensure a future for these spectacular primates.